It's official! Cher can turn back time! This diva has been at her best for decades and shows no sign of slowing down. Come see her live in all of her over the top, drop dead gorgeously coiffed glory! 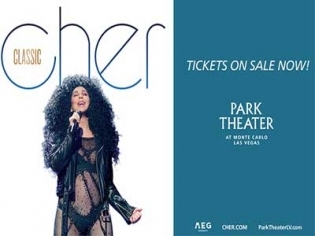 Save when you buy tickets to see Classic Cher by booking online. The concert you’ve been dreaming about is returning to Las Vegas. Catch the ultimate diva at the Park Theater at PArk MGM. Cher brings her classic tour with all her old standards, extravagant costumes and a trip down nostalgia lane. Cher will descend in her “birdcage,” and give a nice monologue making her seem more real than her Bob Mackie gowns. A tribute to Sonny Bono is followed by a cheeky, black-leather clad “If I could Turn Back Time.” This is a victory lap for the iconic star who has won a Grammy every decade since 1965. Get your tickets now for this limited run.